TEKLYNX International, the world’s leading barcode and RFID labeling software developer and solutions provider, today reported a TEKLYNX CENTRAL CFR enterprise barcode labeling software implementation significantly improved labeling accuracy, efficiency and industry compliance for growing medical device manufacturer Aspen Medical Products. A leading manufacturer, marketer and developer of upper and lower spinal orthotics, Aspen Medical Products continued to experience international growth, prompting a re-evaluation of its labeling operations. “We were looking to implement a standalone labeling system that would eliminate manual entry, integrate with our existing ERP system, and handle language translation demands,” explains Aspen Medical Products Planning Manager Israel Lopez. Aspen Medical Products also sought a labeling solution that could improve its ability to meet vast and ever changing medical device compliance standards such as the FDA’s standard 21 CFR Part 11 which requires approvals via electronic signature. With TEKLYNX CENTRAL CFR, the company now has access to a label approval module that allows for electronic approval while providing the required security and traceability in accordance with FDA 21 CFR Part 11. Aspen Medical Products also has the ability to create complex, UDI-compliant barcodes, such as HIBC or GS1 Databar, to meet other FDA compliance and healthcare industry standards. Aspen Medical Products also eliminated weeks from its label approval process when dealing with global contractors. “In the past, when our contractors in China would make a label, we would send out label copy and ask them to generate a label using their own system and send it back to us,” explains Lopez. “This back and forth label creation and approval process could take weeks.” With TEKLYNX CENTRAL CFR, the company can centrally control labels and make changes without disruption to global print users. 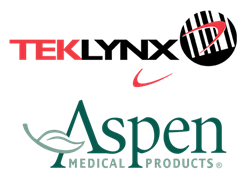 To read more about Aspen Medical Products’ experience with TEKLYNX CENTRAL CFR, download the full case study here. To learn more about TEKLYNX barcode and RFID labeling software solutions, visit teklynx.com.